Suryanamaskar can do to your body what months of dieting cannot. And it can do to your mind what no spiritual discourse can. Not surprising, the world is going crackers over this ancient yogic tradition of worshipping the rising sun. What with the likes of Jennifer Aniston, Victoria Beckham and Kareena Kapoor endorsing it over gym workouts and bizarre diets. From improving your posture, strengthening muscles to whittling extra inches around the waist, the benefits of Suryanamaskar are many, provided you adapt it the right way. 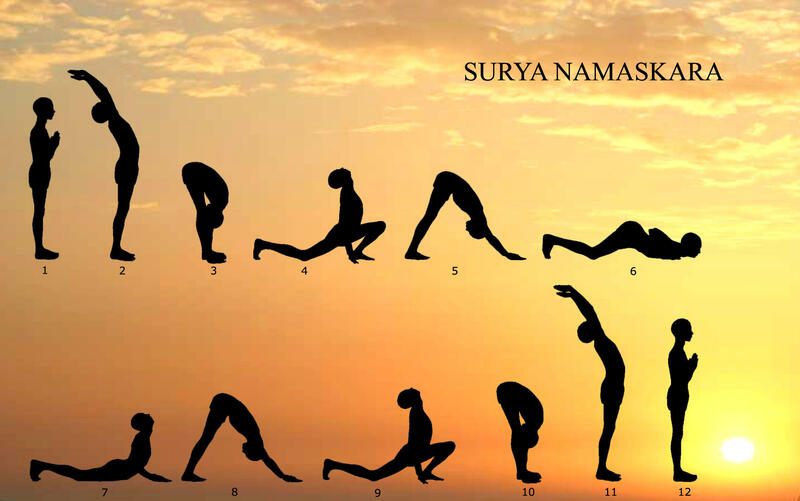 A set of 12 fixed, cyclic postures define Suryanamaskar which when performed repeatedly at an easy pace can bring a sense of well being, almost immediately. However, those with a heart condition, arthritis or slip-disk, need their doctor’s consent before starting the routine. Suryanamaskar’s surging popularity notwithstanding, jumpstarting a schedule is most definitely not the best thing to do for a fitness novice. If you have been gravely out of form in a way that you haven’t stretched your muscles in ages, first give your body some time to open up, which you can do with some flexibility and stamina-building exercises before embarking on the more arduous ‘Suryanamaskar’. And once your body has registered a certain fitness level, you can begin with a set of three Suryanamaskars in the first instance and increase it to five then ten and more depending on your stamina. Anymore than clocking up numbers, it is important to get each posture right, for the very essence of this yogic ritual lies in perfecting every move. To say the least, it can be an uphill task for beginners. But our expert-backed warm-up exercises are sure to make Suryanamaskar less strenuous and ever so graceful. 1. Neck: Breathe in while you turn your neck to the right and breathe out as you come back to the starting position. Again, breathe in while turning your neck to the left and breathe out in the centre. Repeat this movement thrice. Rotate your neck first clockwise and then anti-clockwise. 2. Arm and shoulder: Stretch your arms out in front of your chest and move your palms up and down, then sideways. Further on, rotate your fist clockwise and anti-clockwise. To relax your arms, place your palm on your shoulder and move your shoulders first clockwise then anti-clockwise. 3. Knee: Bend forwards with your palms resting on your knees, join your knees and move forwards and backwards. End the routine by rotating your knees clockwise and anti-clockwise. 4. Stomach and back: Interlock your fingers over your chest and slowly raise your hands upwards while you breathe in and stand on your toes. Return to Position 1 as you breathe out. Repeat this cycle three times. 5. Legs and waist: Stretch your legs wide in standing position, touch you left toe with the right hand, then the right toe with the left. Keep your knees straight while you do so. Repeat a few times. By now your body is suitably warmed up to begin the Suryanamaskar routine. 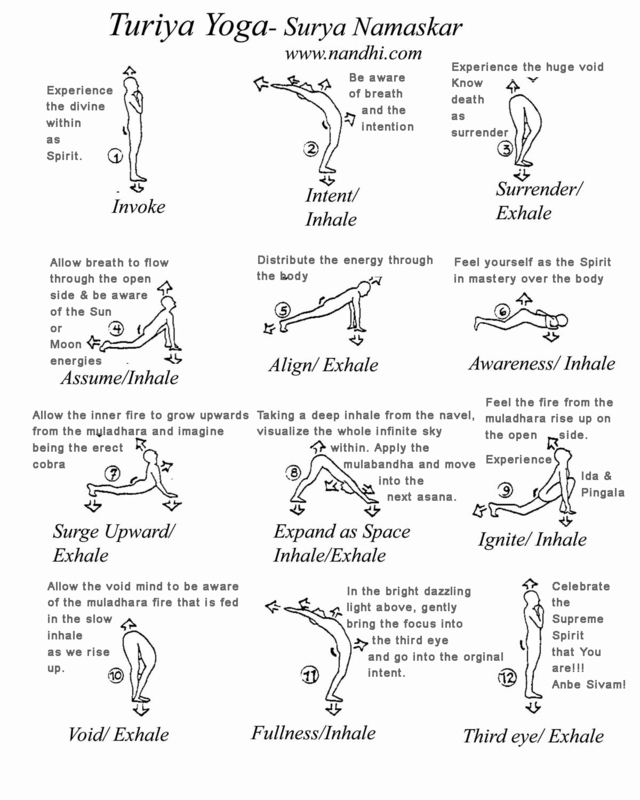 Here is a step-by-step account of the 12 postures. Don’t try this routine on a mat, you are better off on the bare floor or on the grass. “From improving your posture, strengthening muscles to whittling extra inches around the waist, the benefits of Suryanamaskar are many”. What are these “many” benefits of Suryanamaskar? In the first place why is it called ‘Suryanamaskar’? This is the ancient Vedic wisdom given in Rig Ved 1.50 as treatment to kill heart ailments हृद्यरोगघ्न्योपनिषद, by exposure to morning sun for ensuring good cardiac health. Modern scientific research confirms that morning solar radiations are very rich in UVB rays (Ultra Violet B) spectrum ,and much lower Infra red radiations that can harm the skin. UVB on contacting human skin converts body cholesterol in to a hormone called Vitamin D.
Just a 15 to 20 minutes exposure of human skin to the early morning sun provides the body with maintenance dose of ‘Vitamin D’. God bless you! Thank you for your informative comment. Thank you for the warm up exercises too!